The nostalgic sci-fi blockbuster is out on Blu-ray this week, and now you can save an extra $5 and check out a few Blu-ray clips! 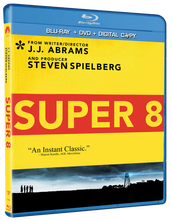 J.J. Abrams acclaimed film 'Super 8' is available on Blu-ray on November 22. From writer/director J.J. Abrams and producer Steven Spielberg comes the sci-fi throwback set during the summer of 1979 that follows a group of kids who notice strange happenings around their town after they witness a train crash. Amazon has an offer by this page to order your copy and use the coupon code WOODWARD to receive the discount. Also, there is a coupon available at www.Super8Coupon.com, which allows users to print a coupon for $5 off the DVD or Blu-ray from 11/22 – 11/27. This offer is in effect from now through November 27.